The 2017-18 MCCC Lady Vikings posed with pink laces for the 2018 Think Pink fundraiser. 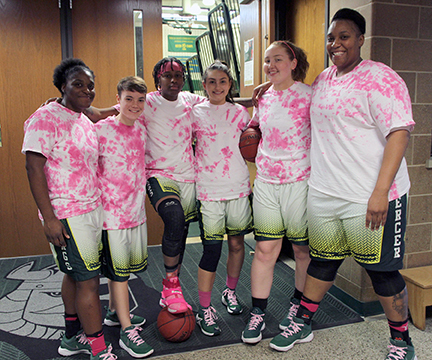 West Windsor, N.J. – Mercer County Community College (MCCC) will host its Think Pink: Breast Cancer Awareness Night on Thursday, January 31 at 5pm on the West Windsor Campus. Now in its ninth annual iteration, the event sees Mercer’s Athletics Department partner with the Breast Cancer Research Center (BCRC) at the YWCA in Princeton, an organization that provides critical support to patients during and after breast cancer treatment. In previous years the evening has featured displays honoring breast cancer survivors, current patients and victims, as well as addresses about the importance of continued research. The 2019 fundraiser is centered around Mercer’s men’s and women’s basketball games. Both teams will face off against Rowan at Gloucester, with the women to play at 5pm and the men to follow at 7pm. Also included in the event are raffles for prizes, including gift cards to local eateries, tickets to Princeton basketball games, and much more. All proceeds from the evening will support the BCRC.